Fine needles for a wide range of fabrics with special needle points that interlace textile fibers. 5 pieces per package with a case for safety. 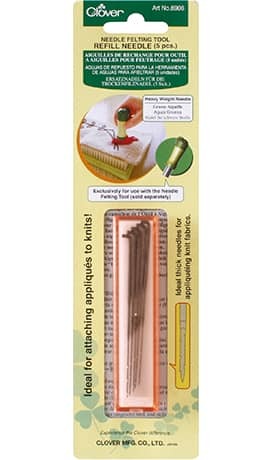 Exclusively for use with the Needle Felting Tool. Never use the needles outside of the Needle Felting Tool. They might break or splinter causing injury. Please read "How to replace the needles" inside. Pay close attention to the points of the Needle Felting Tool needles; they are very sharp.